My REALTOR® friend Barry Rose read yesterday's article in REALTOR® Magazine about the real estate shadow inventory and wondered what I thought. The number of homes in the shadows, as measured by CoreLogic, is falling. They basically calculated the number of new foreclosure sales and compared it with new lis pendens filings to see that the rate of sales was higher than the rate of new filings. But I think we should take a broader look. First of all, the term "real estate shadow inventory" is generally used to define the group of homes in distress that are not currently on the market. The term was coined to acknowledge that homes for sale in the MLS are not the entire supply side of the housing market. There is a group of homes that cannot be exactly measured, but are known to be "needing to be sold," and thus the term "shadow inventory" became popular to describe these homes. I think the term "real estate shadow inventory" should be standardized by our industry and used when discussing ALL of the homes that need to be sold, but which are not yet on the market. These homes are "hidden in the shadows." Long-term readers of the Tallahassee Real Estate Blog can remember me writing about this several times in the past, and if you want to get up to speed on the real estate shadow inventory in Tallahassee, just follow this google search for a list of quite a few articles on the housing shadow inventory in Tallahassee. 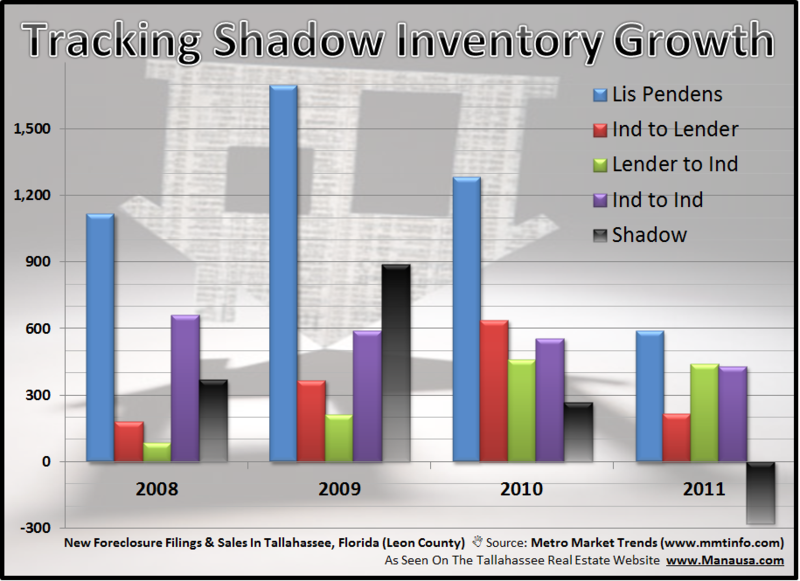 The real estate shadow inventory in Tallahassee appears to be mirroring the findings from CoreLogic, though our shadow inventory has only fallen 16% (compared to the national figure of 22% found by CoreLogic). 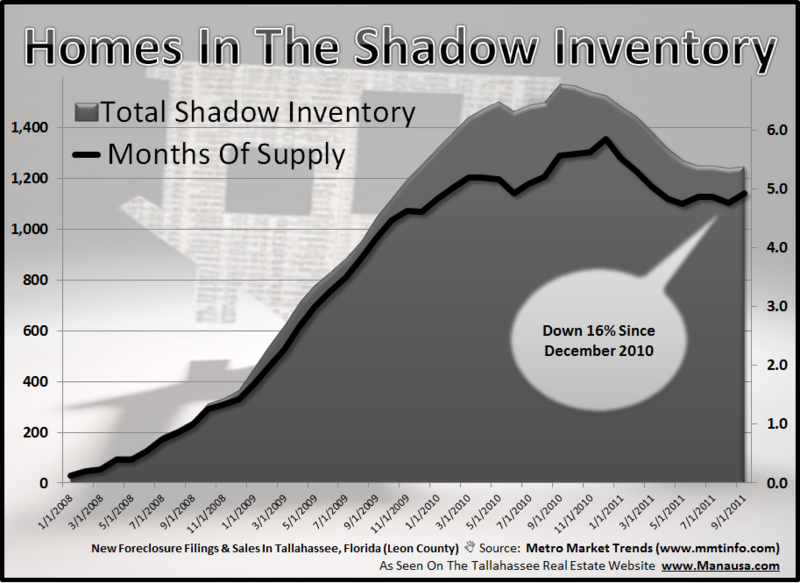 This graph shows Tallahassee currently has a minimum of 5 months worth of supply in the real estate shadow inventory. Unfortunately, this is compounded with the same amount or more in recently failed home sellers, plus the 11+ months of supply of homes for sale in the Tallahassee MLS, it is safe to say that we have more than 2 years worth of supply of homes. This is bad news for home builders (and our local economy) as we will not be needing to build any new homes for several more years. The following graph shows a picture of the data I used to determine the current state of the real estate shadow inventory in Tallahassee. It is important to note that this information is very accurate, though it does not include any homes that entered the shadow inventory prior to 2008 (meaning our shadow inventory of homes is most likely a little larger than my findings show). For the purposes of our analysis though, it paints a very clear image. The graph above shows the "hidden math" behind how CoreLogic and my results were found. The blue bar measures the total number of new foreclosure filings each year (lis pendens filings), the red bar measures the number of transfers from individuals to lenders (foreclosures and deed-in-lieus), the green bar measures the number of foreclosure sales (lender to individuals), while the purple bar measures the number of individual to individual sales (pre-foreclosures and short sales). Finally, the black bar shows the impact on the number of homes in the real estate shadow inventory. I agree with REALTOR® Magazine and CoreLogic, this is indeed good news. But as CoreLogic concluded in its report, there are a lot of bogeys out there still to be encountered. Property values are falling, thus homeowner equity is falling. This means a higher difficulty in selling homes, and home sellers make up more than 1/2 of the buyer pool, so it is a self-fulfilling problem in that our buyer pool continues to shrink while the potential for distressed home sellers grows. This problem is not going away in 2012! If REALTOR® magazine would address the issue of failed home sellers, I suspect we might even be able to get NAR off of the "things are wonderful" reporting track. And if our industry leaders would paint a more accurate picture, we most likely would see better decision making by the banks (read that as they would accelerate the process for short sales) and better support from our political "leaders." The issue of the real estate shadow inventory will be with us for several more years, and the market would be best served by decisive actions by those that control the banks and our government (soon to be one in the same?). Let's see if the banks are gearing back up now that robo-signing is behind them. 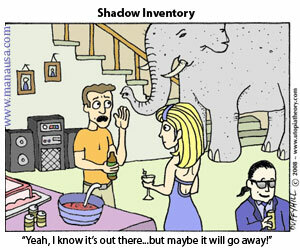 Then we'll know if the shadow inventory is really shrinking. I agree Ron. The trend has been nice while the banks were fixing their problems (you know, like forging documents), I'll be curious to see what new lis pendens filings look like over the next 6 months.